Mother of Pearl beads shine with their own nature-endowed irridescence. Mother of Pearl (MOP) is the iridescent substance that forms the lining of the shells of some fresh-water and some salt-water mollusks. MOP is also know as nacre. Like the pearl it is a secretion of the mantle, composed of alternate layers of calcium carbonate and conchiolin. Many people often wonder what is the difference between Mother of Pearl beads and Shell beads. Mother of Pearl is derived from the inner lining of some shells and it has a natural luminense to it. Shell beads however could be from any shell (like clam) and can be made from the other layers of the shell or even from the whole shell. The term "Mother of Pearls" was coined by the 15th century Europeans. They literally meant it to denote that this was the best and the mother of all pearls. It is easy to understand why it should have earned such a pretigious name: many mother of pearls can look absolutely breath-taking under various lighting conditions. Mother of pearl can have captivating irridescent, shimmering rainbow colours often thought to be reflecting of the shifting colours of the ocean beds. Mother of Pearl is often associated with June birth dates. So if you are thinking of making some fantastic jewelry pieces for someone born in the month of June, you would not go amiss by getting some glorious Mother of Pearl beads. They bespeak of class and luminence. 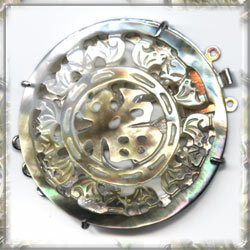 Mother of Pearl is widely used and glamourises many facets of our lives. It is often used as inlay for jewellery boxes, mirrors, home decor accessories, tableware, and much more. It is definitely used in Jewelry Making and Craft work. Watch faces have been adorned with Mother of Pearl. And without a doubt, there is now an every growing of Mother Of Pearl Beads and other jewelry findings. The variety is ever growing and continues to inspire many to higher levels of creativity. Even from olden times, mother of pearl has been valued and was used to make a great range of luxury items. Perhaps the most notable and widespread use of these were as Mother Of Pearl buttons. Today such buttons can still be found even though they have largely been replaced by plastic, glass, and metal buttons. Many prestigious clothing names still use mother of pearl buttons for their top range clothing. In jewelry making, Mother of Pearl beads and other shell beads have recently made a bold and widely welcomed reappearance. Today, it is not only the glorious colours and inner glow that makes the beads and jewelry findings from Mother of Pearl so popular, but also the growing variety and shapes that are being produced.